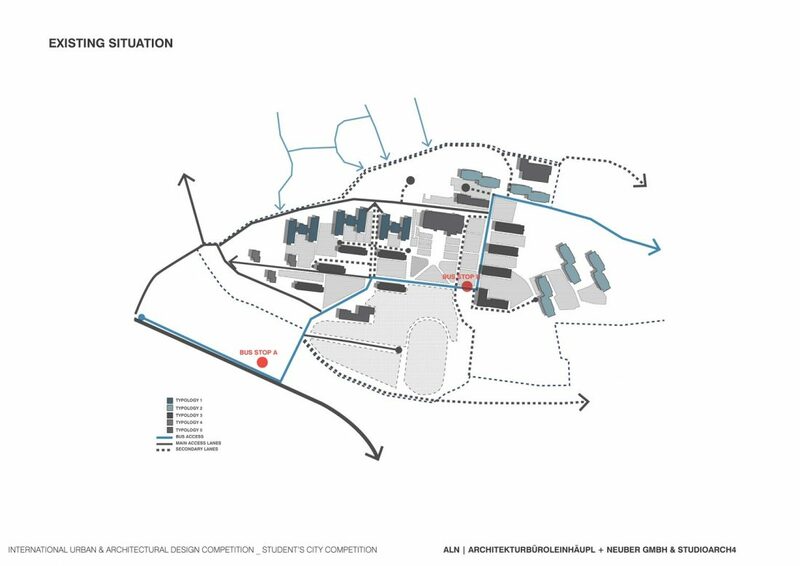 Our proposal for the Student’s City Campus consists on the hybridization strategy, which is a redefinition of all the functions of the campus. 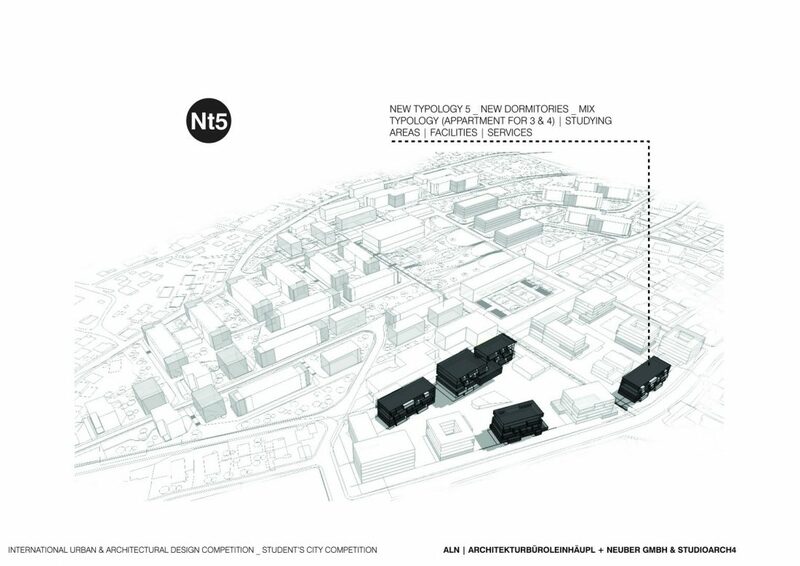 The hybridization strategy will contribute on the addition of new necessary programs and the creation of mix typologies that will enrich the quality of life and spatial conditions. 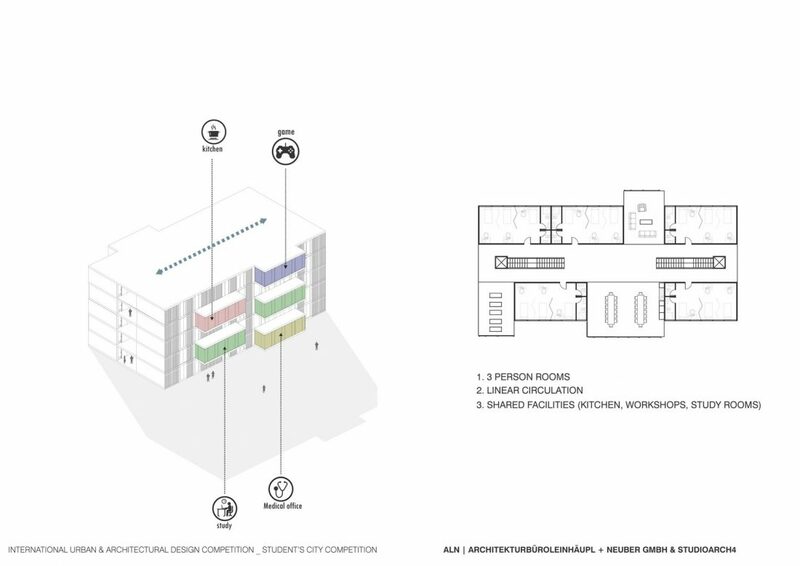 Having a hybrid building means to offer a typology that can host students and the locals that occupy all the surroundings of the city of students. 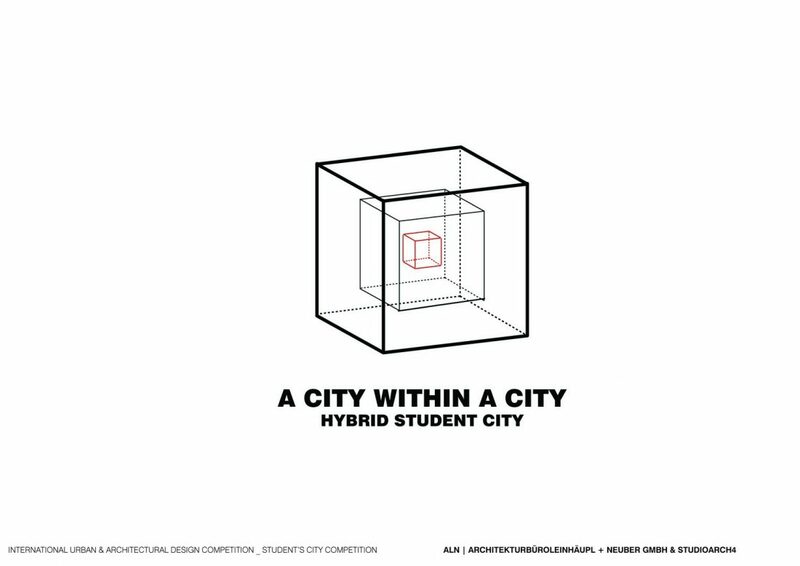 In such a way we create a city within a city, where locals and students create the community and where students characterize the new society. 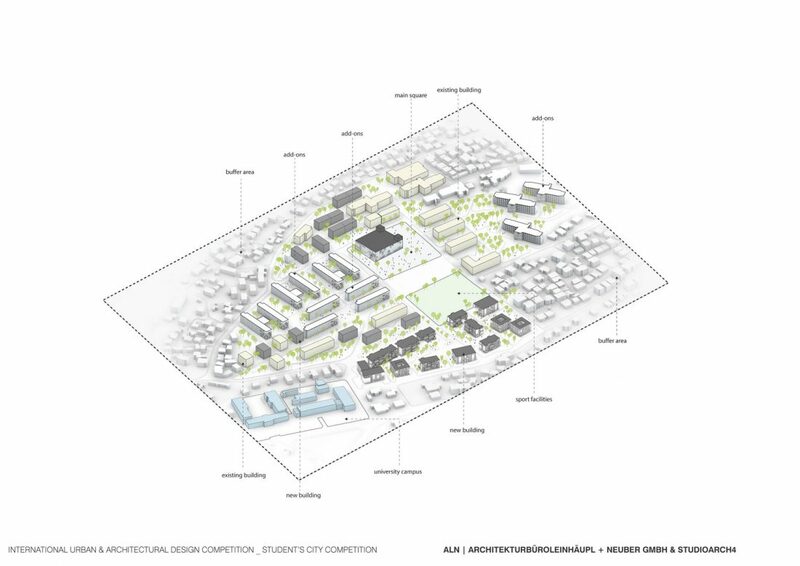 The principal challenge of the master plan is to redefine undeveloped areas, to structure the existing spatial conditions, to propose new dormitory areas and such a way augmenting the number of students during one academic year. Reactivating bypassed areas and contributing with a complex of functions, are two important challenges we tackle. 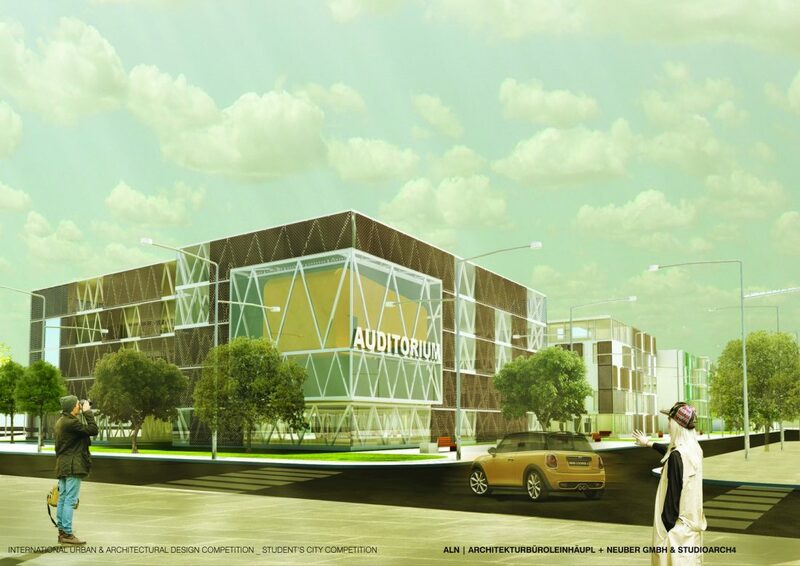 We aimed on creating a campus where students will find every necessity they need and in relation to their financial conditions. We believe in the potential that mixed used buildings have on the better development of social life. In terms of restoration and re-qualification, the challenge was to deal with a very old degraded construction, and with the partial change of some typologies. 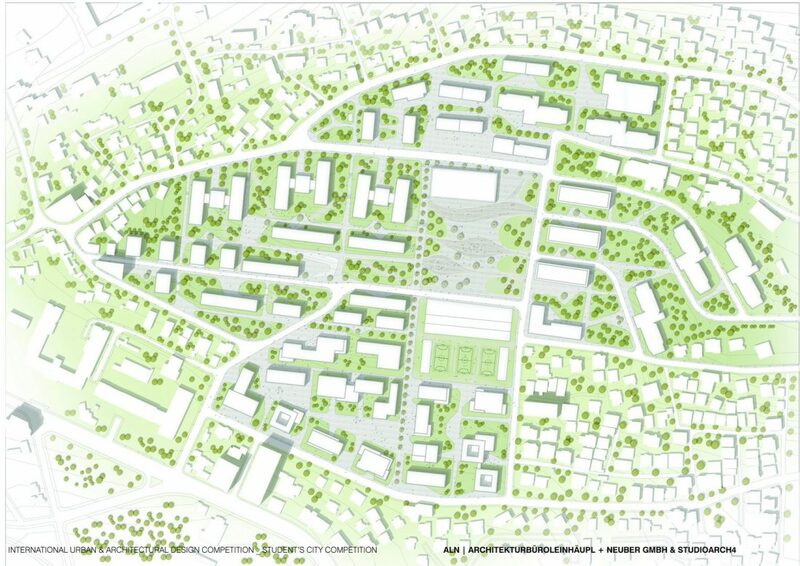 The “bottom-up” approach, where modernist-planning mechanisms will not make changes and decision. Understanding cities complexity was suggested by authors such as Jane Jacobs (1961) and Christopher Alexander, through their arguments against the mechanistic of ‘top‐down’ scope of Modernist planning propositions, which suggest that the design is able to set, control and limit potential functions. In contrast, Jacobs suggested that the problem that cities constitute should be addressed through inductive thinking and ‘thinking of’ processes. This implies a consideration of city organization as a complex field where multiple variables are “interrelated into an organic whole”. 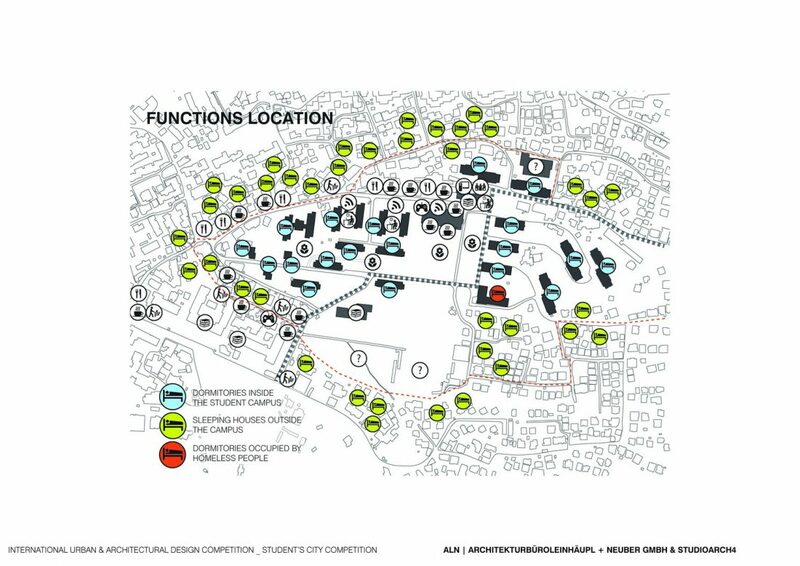 Secondly, the idea of space syntax treatment, where the space is not just a backdrop for human activities. Space also takes form social context, but also gives form to this context. In this way, space and context are reflected into each other. Sometimes change may seem unpredictable, sometimes even chaotic, but if you can try to predict some changes that people usually do inside their living environments, later on you can use these types of changes as matrices that will condition every design process. Flexibility seems as something positive, but without forgetting opposite thoughts about this issue, we have to balance both negative and positive characteristics. 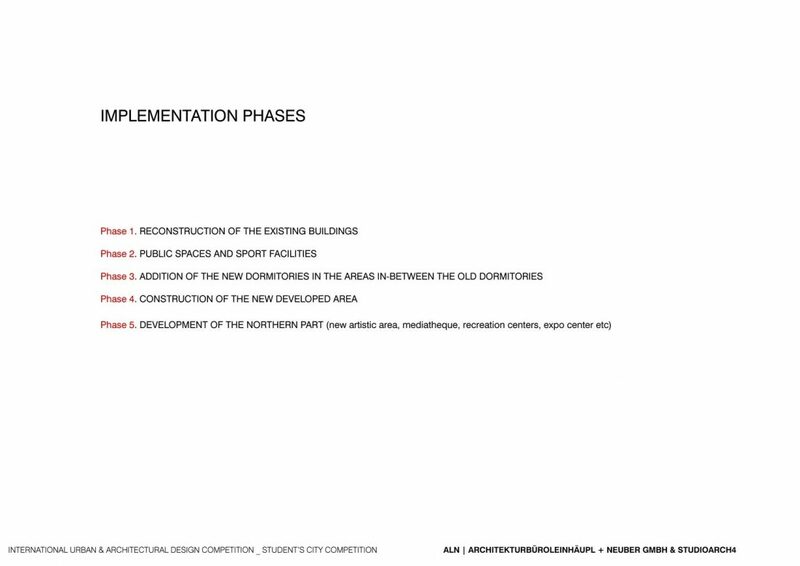 The most important thing is to study the needs for flexibility in the Albanian context and to adapt the apartment scheme according to this reality. Collective housing architecture is one of the biggest protagonists of everyday architecture in the last century, period in which all the normative, formal and esthetic collections were established. This new typology was developed as a result of an enormous lack for accommodation after the migrant population reached the cities after the Great Wars in Europe. The huge demand for dwelling units required an economic and fast solution. Solution was a uniform building made by standardized components and subsystems. Final result was the thousands of hundreds of dwelling units that couldn’t be transformed and adapted according to different requirements for changes during the time. The first impact was really hard, because for the first time they had to deal with standardization, uniform, stiffness and sometimes even hygienic and dimensional problems. 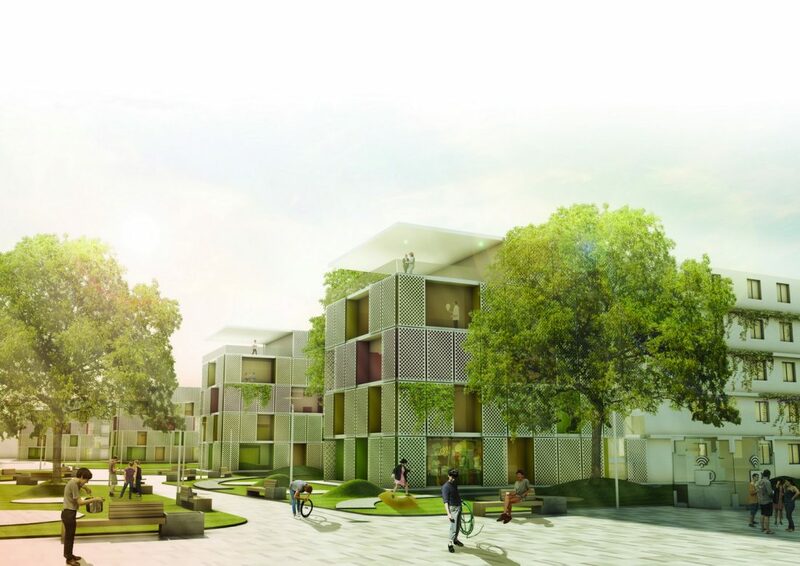 High-density housing often creates social problems due to the lack of social interaction, anonymity of their inhospitable access environments and failure to provide adequate connection to outdoor space. We need to know how housing needs and other issues of the housing system, such as household numbers and types, are likely to evolve in the medium term, and how they will be affected by changing in economic, market and other conditions. Extending housing options for families in our city, keeps the community vibrant. 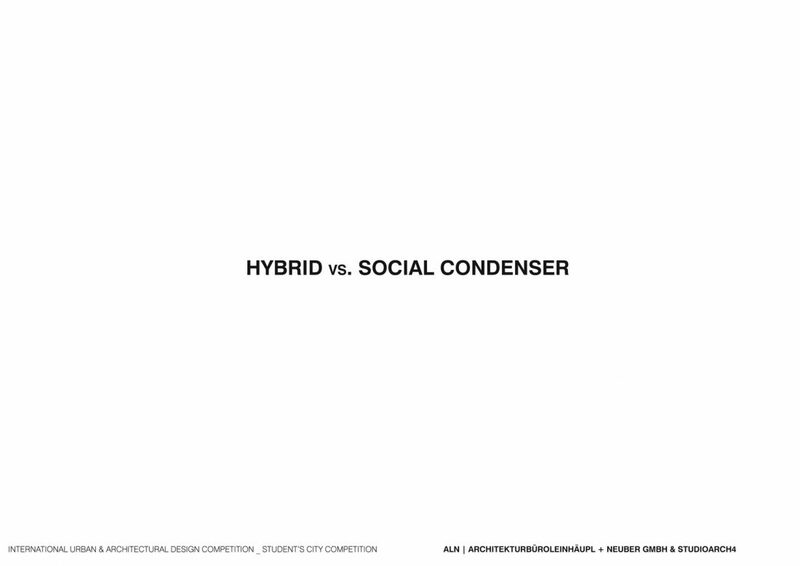 Based on soviet constructivist theories (mainly Moisei Ginzburg and Ignaty Milinis), the social condenser is a type of high-density building that suggests social behavior to its habitants. Its goal was to create public spaces located within the building that would behave like social hierarchy breakers. Overlapping and layering programs within space through the usage of circulation created all this. Shared circulation areas would serve also as zones with different usages. Being located within the circulation paths, the intention was to stimulate social interaction. The first experimental dwellings designed for mass production would in the end prove disappointing, but Ginzburg still upheld the importance of industrializing construction in order to solve society’s housing crisis. One of the buildings associated with the idea is the Narkomfin Building in Moscow (1928-1932) Political events had a huge impact upon the Narkomfin .The ambitions to be the architectural engine of social reform in Russia were so radical that they were abandoned almost as soon as the building was complete. But there are also other examples such as Unite d’Habitation, the Gallatarese Complex in Milan, Park Hill in London etc. But what are hybrid buildings? 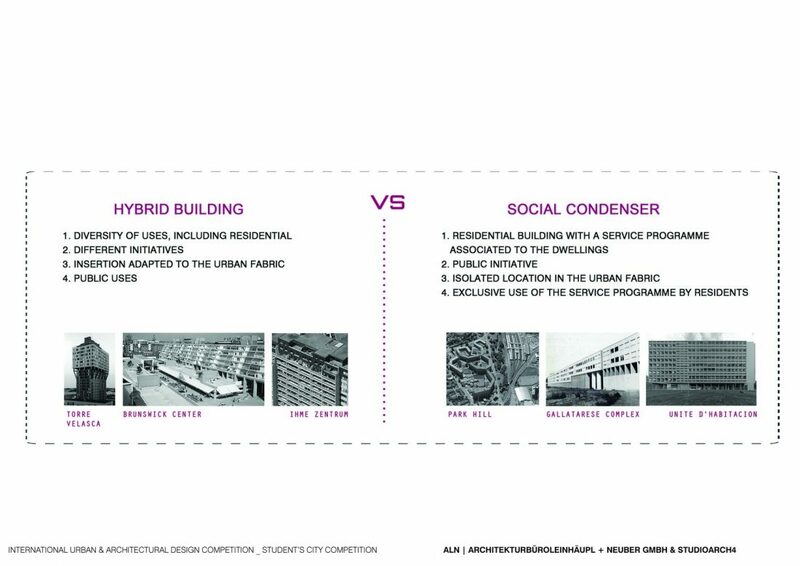 Hybrid buildings are complex buildings that are not based on remnants of previous mixed typologies, fixed hoping to correlate with each other. They are a new being with a unifying personality that does not reflect any previous model or typology. They are celebrations of diversity, choice, and complexity, variety of programs and to the individual creation of the architect. It works as a building with multiple skills, combining different functions into one where it feeds on the cross of public and private sphere. 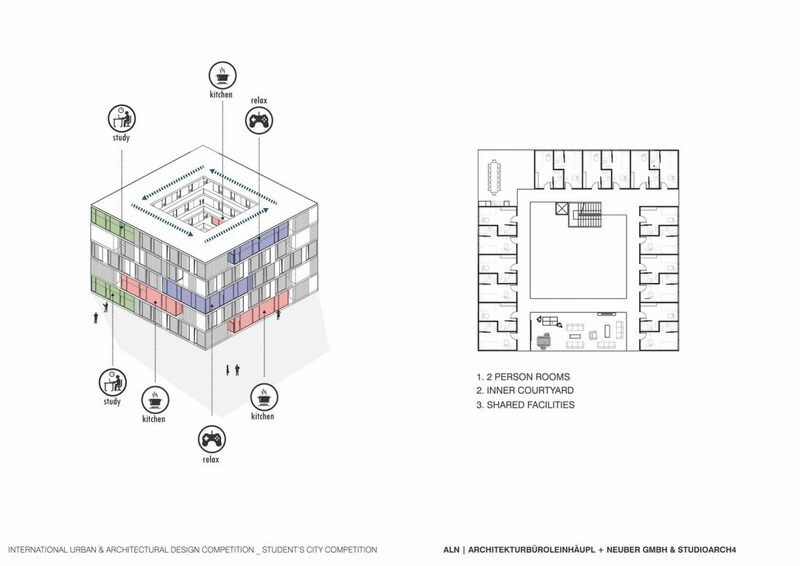 The hybrid building is permeable from the city 24 hours, allowing also its habitants to use every function every time during the day/night timetable. This means that activities are constants and are not restricted by public/private rhythms. It is the creation of a new use building, a full time one. If we want to describe these types of building by their form or appearance, we can say that they try not to respect the generic building principles of being united into one solid mass. They function as a habitat created to change, in order to adapt with every programmatic and functional change. There are different examples from nowadays, but also some older ones such as: Torre Velasca, Ihme Zentrum etc. 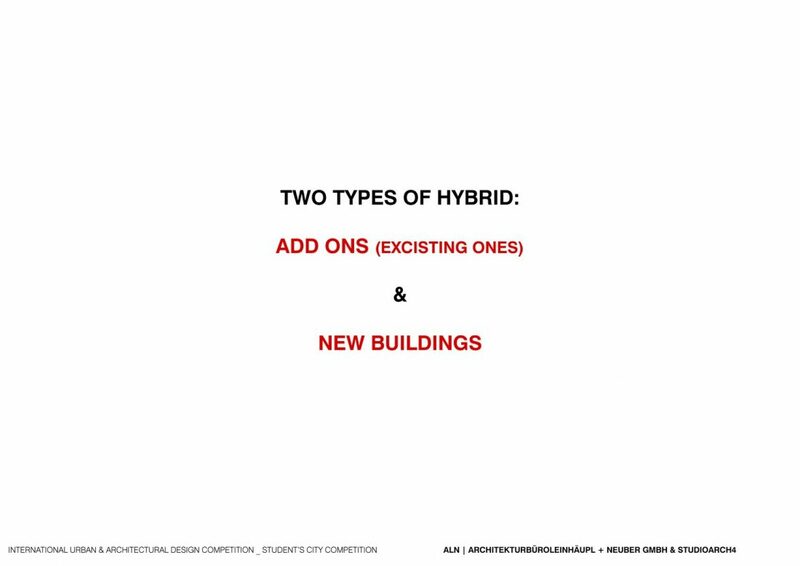 As we see, hybrids are buildings that suit better the nowadays-urban conditions, giving to residents a rich program, but also fitting perfectly into the urban pattern of the city. Being complex, they allow creativity and original solutions in the composition of the whole as part of a greater complex system, where nothing is predetermined. Typology is not anymore part of a prearranged scheme, but diversity in volumes prevails over tradition and approved practices. It condenses the functions, but gives freedom to form. 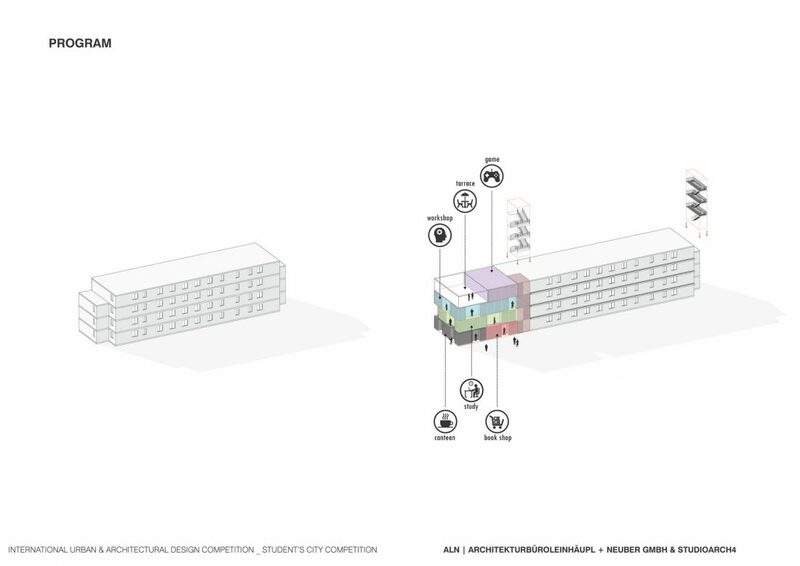 Our aim is to disassemble and reconfigure known configurations into a new proposal that will be inserted into the Student’s City with certain rules that correlate with the existing spaces and buildings. 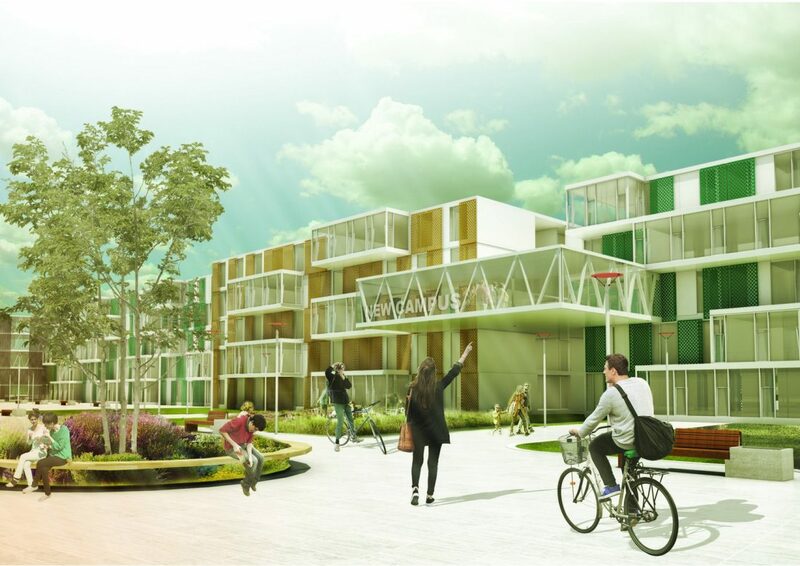 Flexible housing is defined in two ways: as housing that is designed for choice at the design stage, both in terms of social use and construction, or designed for change over its lifetime. Families have indeed changed behavior and size and the services that they require are in rapid evolution. Every day we face new family typologies that constantly have different needs. It is no longer necessary to build series of standard houses but flexible homes genetically engineered where everything is different as so are its inhabitants. This means thinking about a residential space easily adaptable to changes over time and to different lifestyles and that allows changeable uses thanks to a higher flexibility. 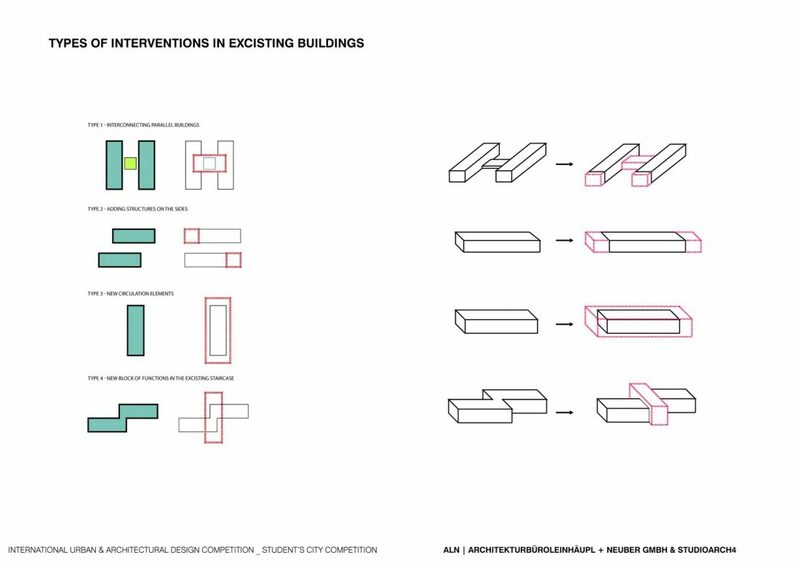 It is very interested to see that flexibility is not a nowadays concept, but architects thought about this issue a long time ago. It was one of the topics discussed during CIAM meting in 1929, where the CIAM Congress was given the theme “the Minimum Subsistence Dwelling” the focus being on design solutions to the problem of high rents for low wage earners. 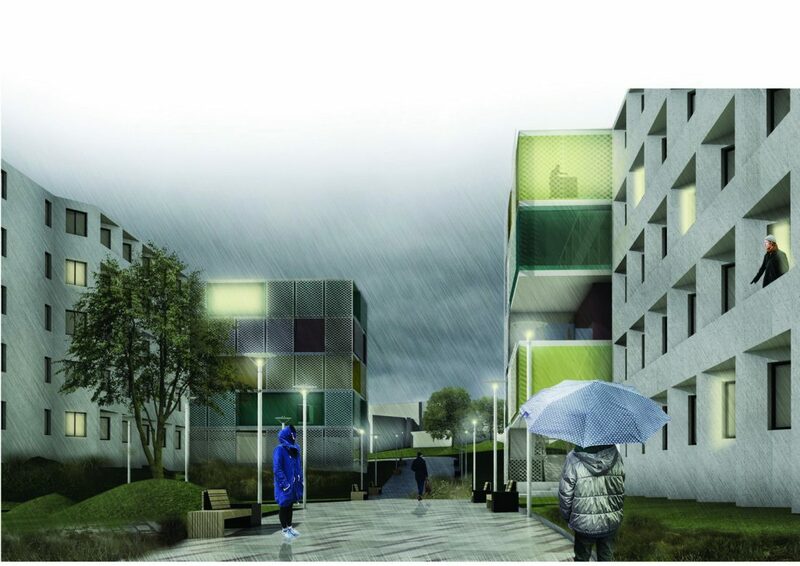 “The design of the dormitory must be “an open process. “Open in the sense of offering continuous interaction with the different spheres of reality, also open in the sense to offer themselves a dialogue and debate that continues between the different participants in the process. Floor plans must respond to shift in household configurations, changes in family (changing social conditions) Flexible apartments required where most rooms are usage neutral in-neutral space at entrance (guest room, study, additional bedroom). This means thinking beyond the classical way, or in other terms as to imagine the buildings as Platonic solids, Newtonian physics and Aristotelian categories. Flexibility lies also in having a room that can be furnished into different types of spaces. The end product should be a model, which is relatively easy to use to test a wide range of scenarios. “Whether flexibility is more expensive is difficult to measure.” But it eliminates old house’s maintenance for selling and new house’s buying. If housing is not able to respond to change, it becomes at best unsatisfactory, at worst, obsolescent. Transformed overnight may be disorienting. Spend unnecessary money that will never be used. Nearly impossible to anticipate the user’s changes. Speaking of hybrid buildings and freedom to readapt the living space, we cannot forget to mention the importance of common spaces in these types of complex buildings. The hybrid is a conglomeration of public and private, where public sometimes prevails and dominates over the private parts. We explained that in these types of buildings change serves as a matrix and this includes also common spaces. Settlements that are marketed under the heading as ‘communicative housing’ tend to attract people with a ‘sociable predisposition’. They may expect to find neighbors open to interact with. Social interaction in a neighborhood is very important for the development of a sustainable society. It develops where spatial characteristics support social interaction between neighbors. 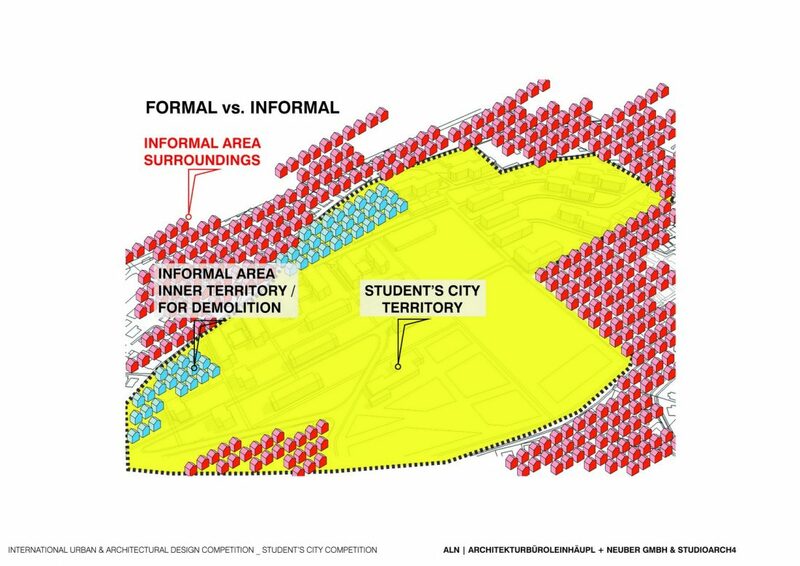 The residential area has certain spatial characteristics that influence or even determine the content and form of the interactions (Kruse, 1974). One can distinguish spaces that enhance interaction and communal actions from those that inhibit these cohesions. 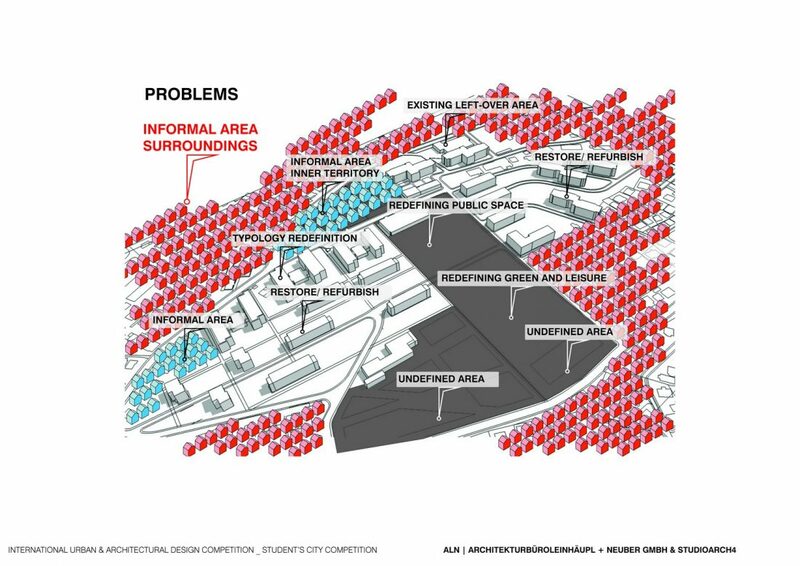 There are different ways to create spaces that offer the opportunity for chance meetings and for interaction within the neighborhood, but mostly within the buildings. If a certain number of dwellings are exceeded, dwellers just loose oversight as to who is occupant and who is not. The number of dwellings sharing one entrance mediates this factor. The entrances divide the residential population into subgroups, thus increasing clarity. 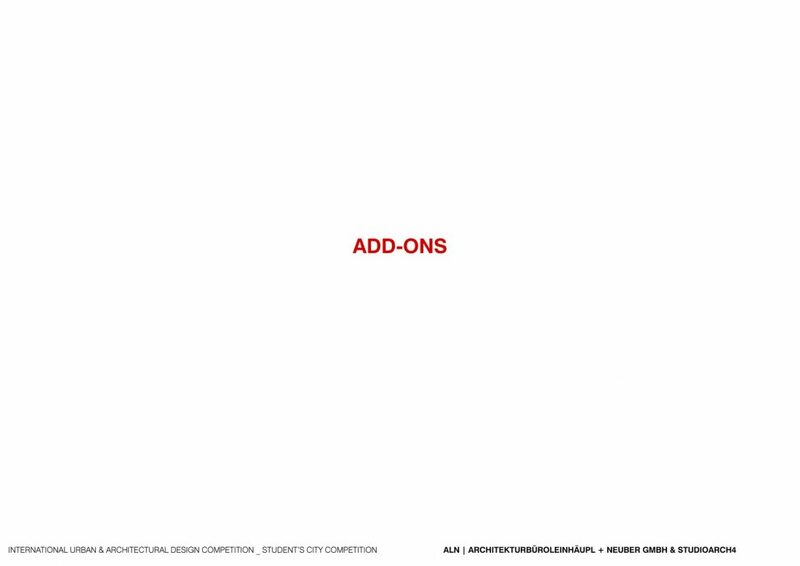 – Restricting the number of floors. Living high up in a building can result in a loss of contact with the ground floor: the area around the building is reduced to a transit zone, used only for coming and going. – The ‘orientation’ of dwellings through front, side, and back doors may be outward or inward (AbuGhazzeh, 1999), i.e. the dwelling may open to the garden or a street, or may give the passer-by a feeling of inaccessibility. Which degree of openness or closure is beneficial for social cohesion is hard to say, and has to be considered in combination with the aspect ‘constellation’. It is assumed that dwellings that are orientated toward each other, further social cohesion more strongly than terraced housing, for example. – Allowing room for play (Gehl, 1987). – Privatization of the green spaces into allotment gardens. – Letting paths that residents use for daily activities cross, for example to the bus stop or to service units such as garbage cans (Abu-Ghazzeh, 1999). 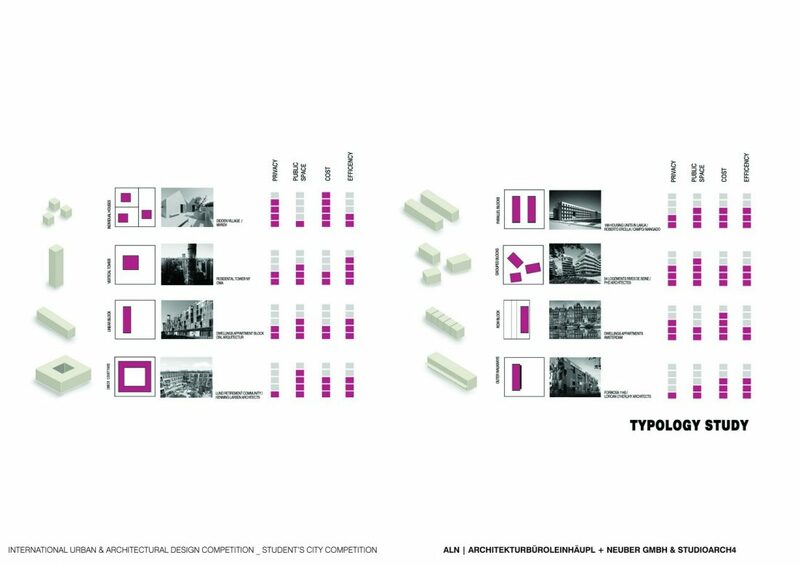 A deep reflection of the long research on typologies is presented in every solution given to the architecture of the project. 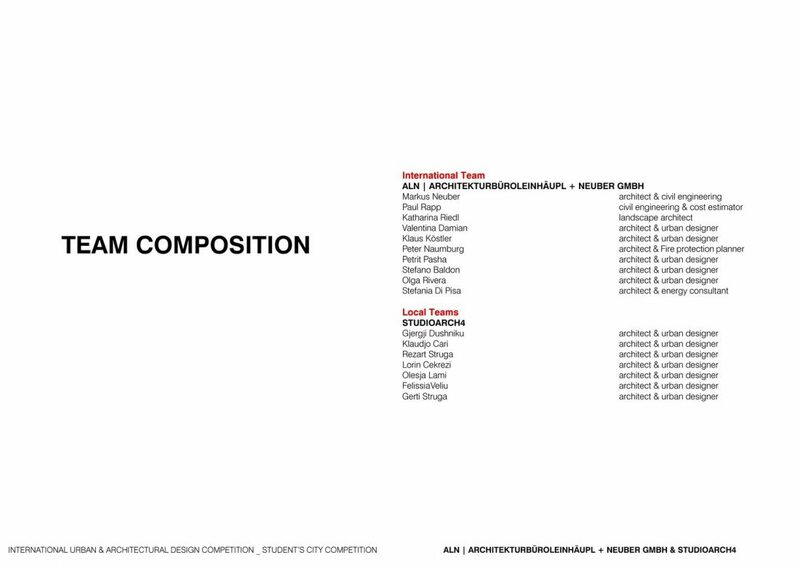 Flexibility, hybridity, multi-programs, communicative architecture, new physical typology, etc. are some of the words that could define what this project represents. 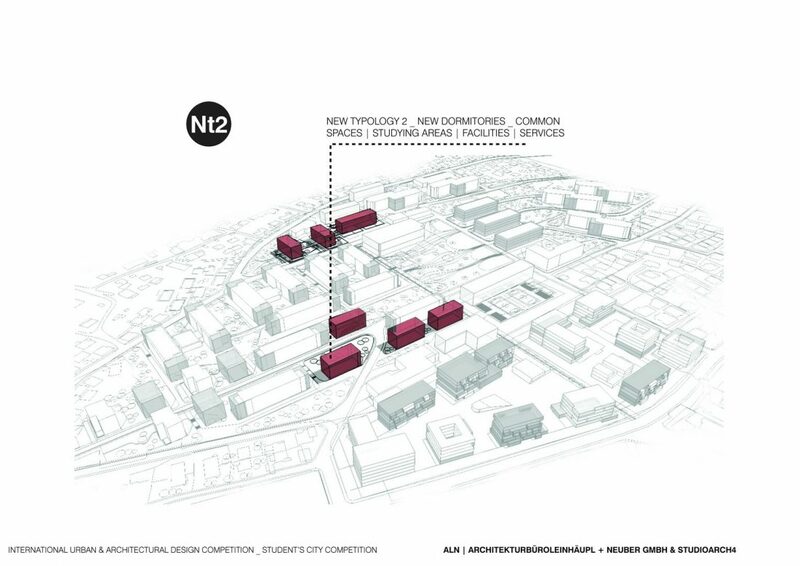 It tends to challenge conventional typologies, use innovative approaches in design and create new economic relations. 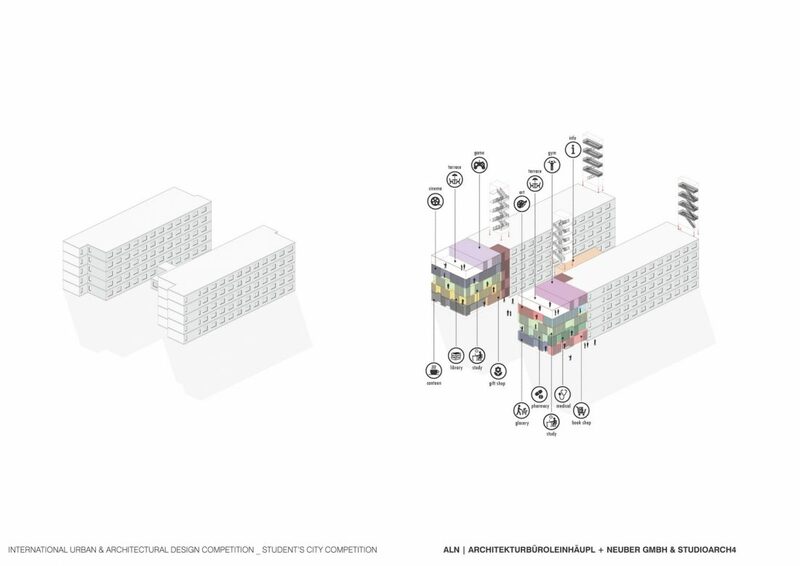 The whole building works as a mini city, but not in a social condenser type of behavior, more like a hybrid, that does not reflect a previous model, especially for the Albanian society. Located in a place that the typology and function is strictly defined, the project is aiming on introducing also new behaviors, new lifestyles and new mentalities. As a hybrid, it tends to merge with its urban pattern and its surroundings, avoiding strong limits and creating every day an inviting space for everyone. It looks like a participatory project, where the students can decide a lot of things, but every decision is somehow conditioned by the program’s choices. Modules are predefined, extensions are predicted and common spaces are located in strategic places. Commonly, housing projects are categorized into different typologies according to the number of habitants, circulation, number of floors etc. such as individual house, linear blocks, vertical towers etc. What happens if we can mix together the positive aspects and benefits of each typology? 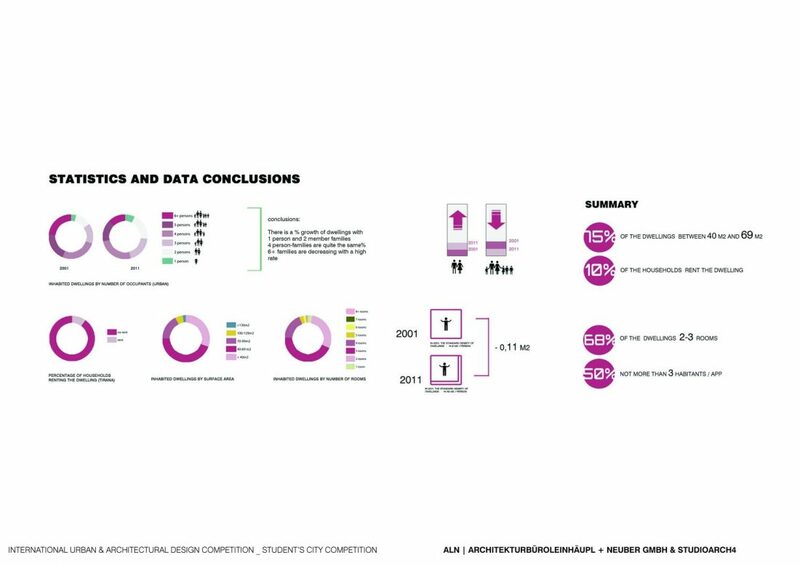 Some of the typologies are analyzed for some basic criteria: Privacy, public space, cost and efficiency. Combining a few of the positive elements of the different typologies, we create a new typology, a hybrid one that takes every benefit from its components. The new building becomes a complex system that tends to make diversity a tool for choices, a new entity with a unifying personality that does not reflect any previous model or typology, a building with multiple skills, combining different functions into one where it feeds on the cross of public and private sphere. After combining typologies in form, flows and circulation allow that the transition from one part to the other is not even noticed, creating a being that works as an entire, even if it is created from different pre-conceived pieces. 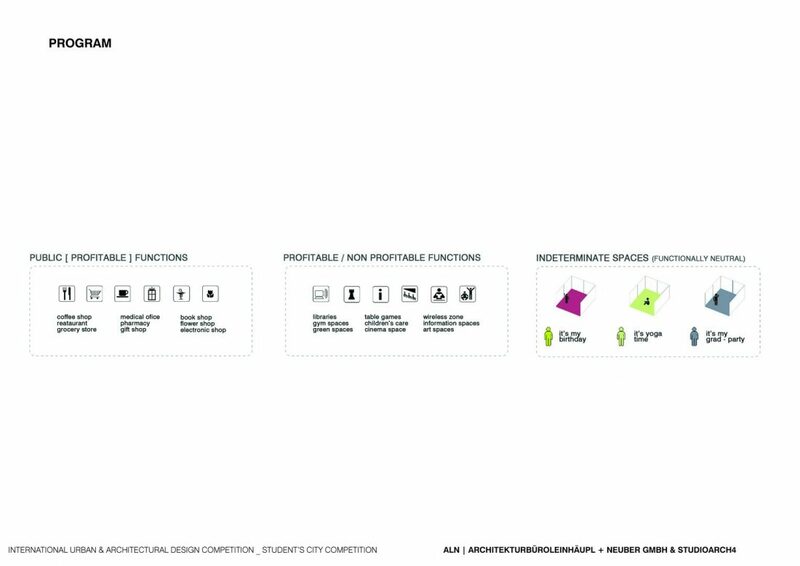 The programmatic indeterminacy is the process by which you can define an “open” project in which there is a diversified definition of the inhabited space from the increased multi-functionality and versatility of the areas of use. 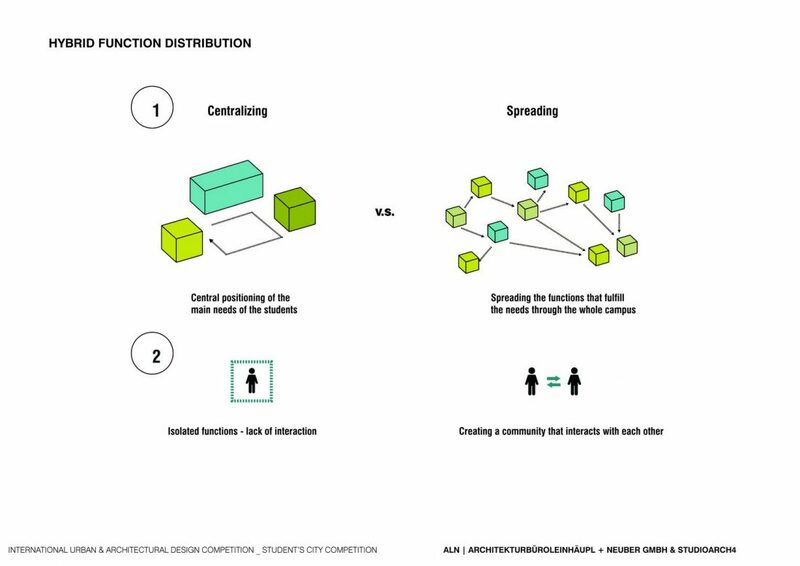 In the design of the project, diversity should prevail as a matrix, able to favor the coexistence of different types and multiple programs within mechanisms and structures. 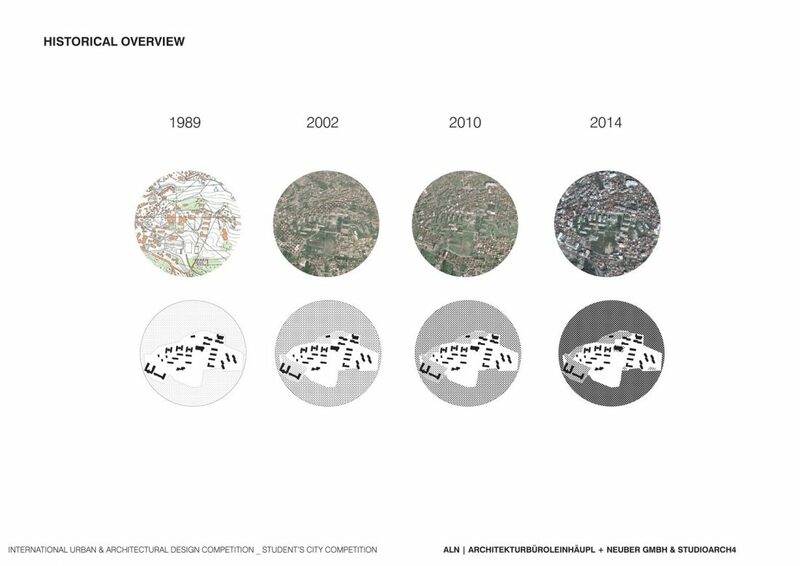 Diversity should affect the spatial aggregation not only in the horizontal plane but also on the vertical axis, not just residential but also “multi-programmatic” introduced in the design by the study of complex sections. What usually happens nowadays in our cities and buildings is the fact that all the functions are gathered in the first floors, serving not just the inhabitants but also the casual passengers in the street. This makes a clear separation between the diversity of services provided at the bottom and the mono-functionality of housing at the top levels. What if every floor has mixed functions and every time you go outside your room you find yourself with the same life rhythm, green spaces and functions as the first floor? In every level we have not just a mix of different functions, but also different types of privacy. Usually buildings, especially housing ones have e very defined level of privacy: we can find a privacy gradient starting from private spaces in the first levels going up to the ones that are totally private. In this building everything messes up by combining different levels in the same floor. All the functions are divided into: profitable ones, non-profitable and indeterminate spaces. Profitable functions include some services like coffee shop, restaurant, medical office, different shops etc. Non-profitable functions are generally the ones that are used by the habitants and by other visitors without paying for their usage. This includes Wi-Fi spaces, table games, cinema, library, gym and sports etc. Indeterminate spaces are the ones that are functionally neutral; this means that they are spaces that serve the needs of the habitants: if you have some party or a special occasion; if you want to use this space for studying or doing your architectural model, you can use this kind of spaces that change over time and needs. 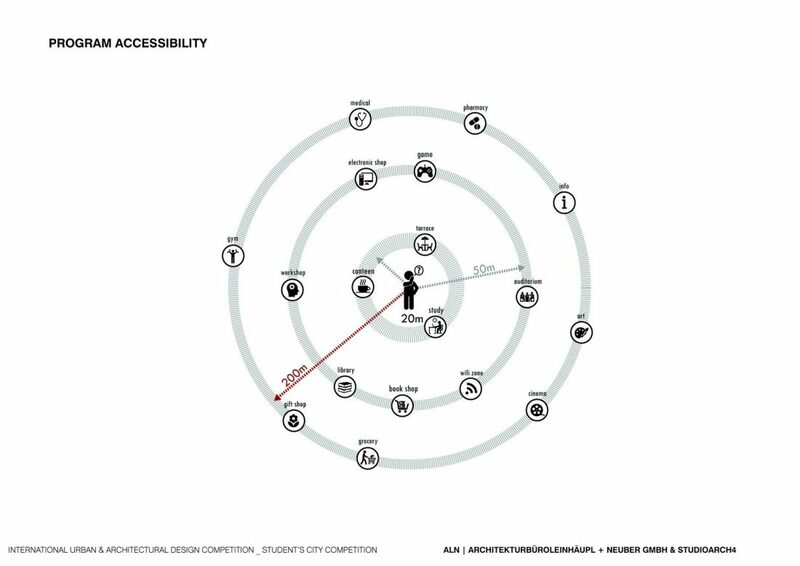 After defining all the different types of functions and the multi-programmatic approach to the building, the next step is to locate every function according to the accessibility, frequency of usage, common users etc. 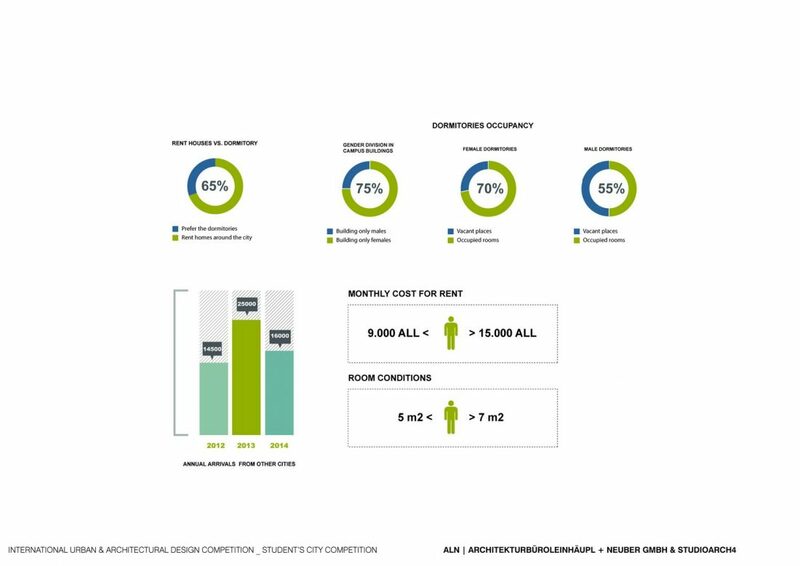 The table shows the distribution of users into the apartments, in different parts of the building and the frequency of usage for every family typology. Student frequently uses some functions, while more large family typologies with children need different types of functions. 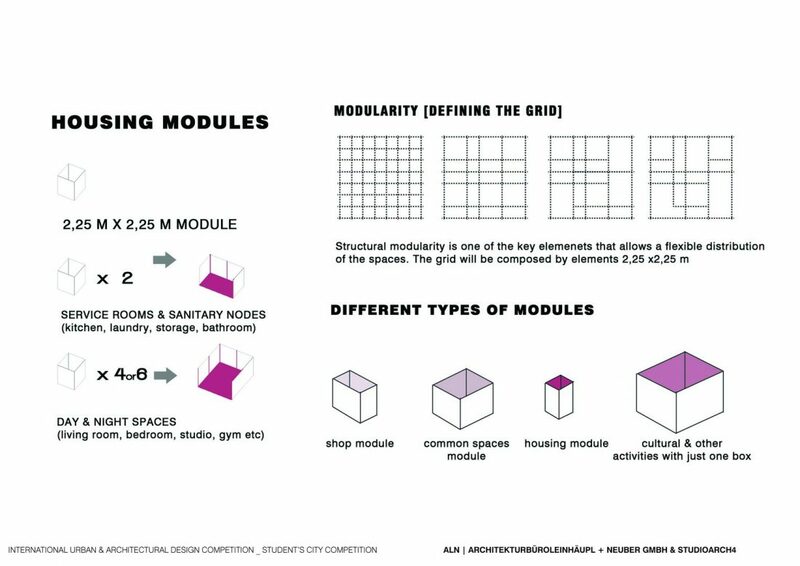 Structural modules can be connected to form one residential unit. These units can then be arranged along a linear corridor or multiple-loaded interior stairwells. Studying all the flexible examples of housing, modularity come as a natural way to deal with change and transformations. 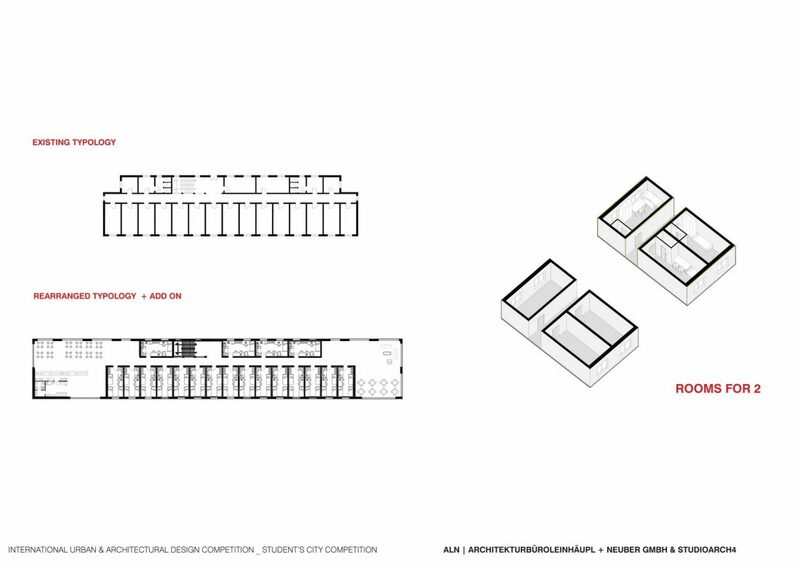 Modules 2,25m x 2,25m, good dimensions for different functions, compose the entire building. We can use half module for corridors, services etc. and double it or multiply it for rooms, public functions, open spaces etc. Modularity is also helping in the structural aspect of the building, in a way that any change in the interior parts does not affect or is not affected by the structural grid. Apartments are also divided into different modules, according to the family type or lifestyle. The smallest apartment is 10 square meters, just for one person, and the largest arrives up to 160 m2 for large families or as a form of individual villas. Circulation is one of the fundamental parts of the project. In this project, circulation plays the role of a catalyst for social interactions. Everything is placed along the paths and, as described in the case of the social condenser, the overlap of the different functions with circulation creates areas of public usage. The building is equipped with large corridors that serve both as a passing space, but also as public space with sitting elements, different functions and green. -Vertical circulation: elevators are distributed every 20-30 m and spread the fluxes throughout every angle of the building. -Vertical stairs: they are called vertical stairs because they are used just for internal circulation within a particular part of the building and have no other function. – Horizontal (Diffused) stairs: are connective elements between two different levels of the building, but that allow a smoother spread of the fluxes and a better connection and communication between different parts. These spaces are transformed into public plazas and are distributed along the building in a way to create a flowing space that connects every part. One will have different options to reach the destination, avoiding this way confusion, perplexity and disorientation in movement. On the other side if we refer to the existing buildings and the restoration process, we intervene partially to each of them, with different strategies. 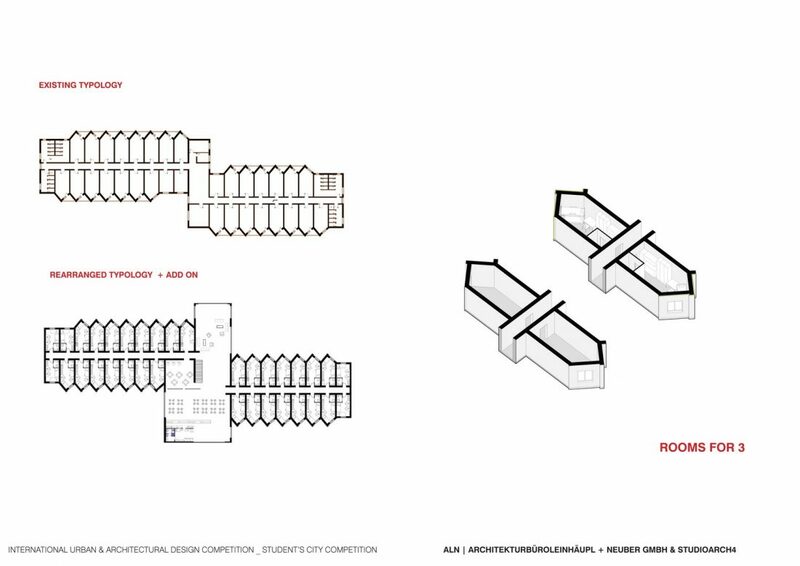 In the typology of the dormitories where the stairs are the central hub, we add emergency stairs on the lateral areas, such a way we offer higher quality in terms of regulations and access. One important example and interesting typology is the one where we change almost all the access diagram. 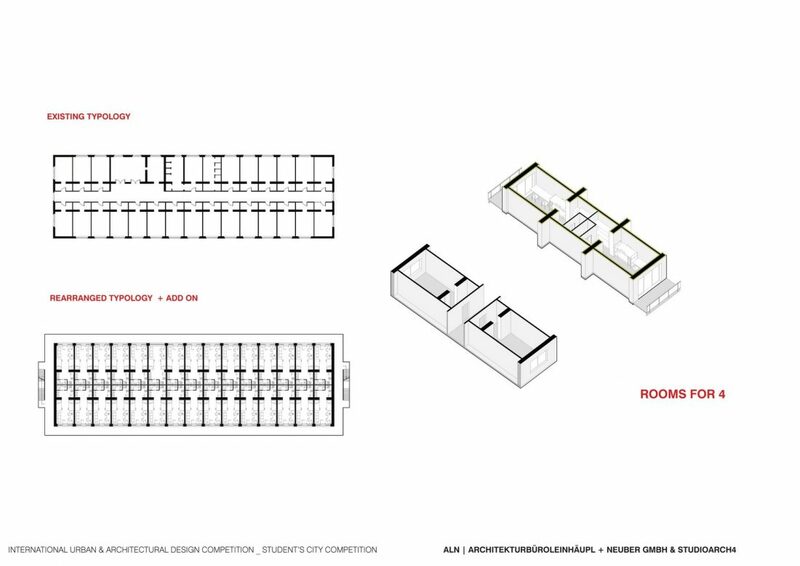 The dormitories that have a linear corridor in the central part we change them into a circular type of access. This change first of all consists on the utilization of the previous corridor as a space where a small kitchen and toilet can be included, and both rooms from each side can have the extra function inside. 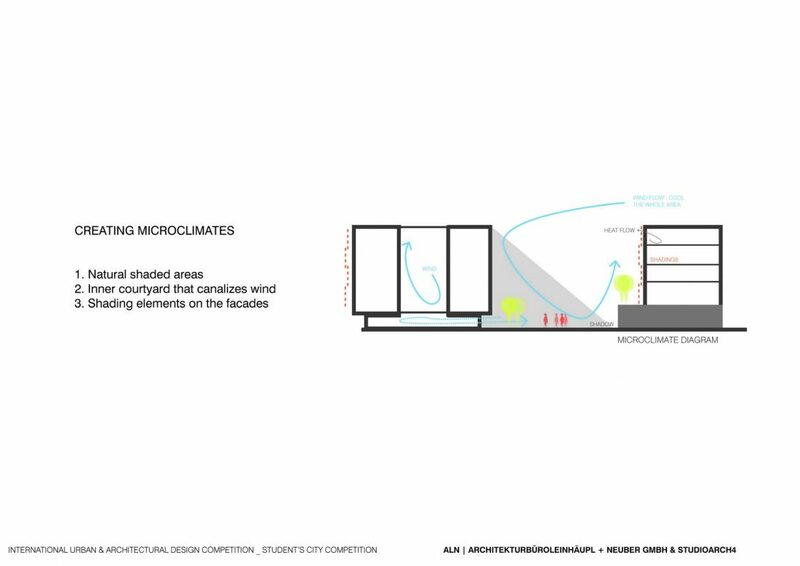 Though to bring access to this new typology, we add a circular balcony-corridor, which in itself is as well a new façade for the dormitory. Access hubs do relate as well with the location of the new added functions. Mainly the staircases are located within the dormitory area and the facilities area. 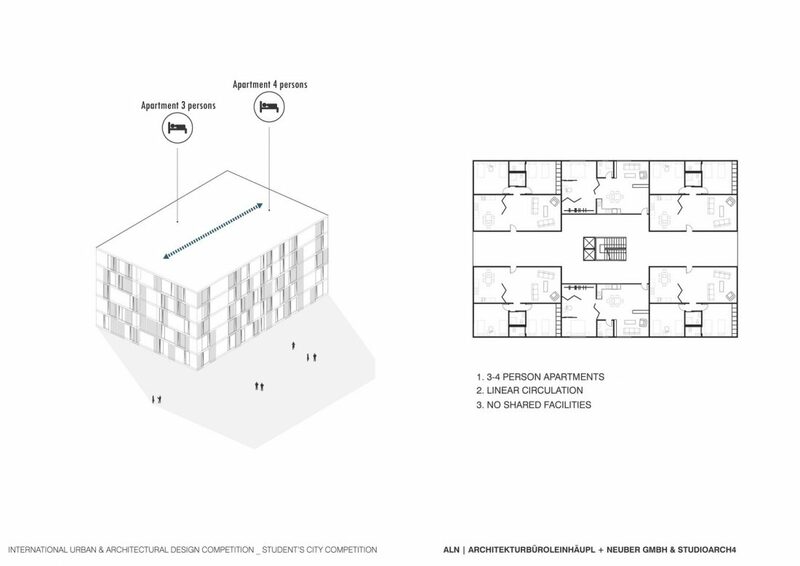 This composition offers direct access for both utilizers of the space. 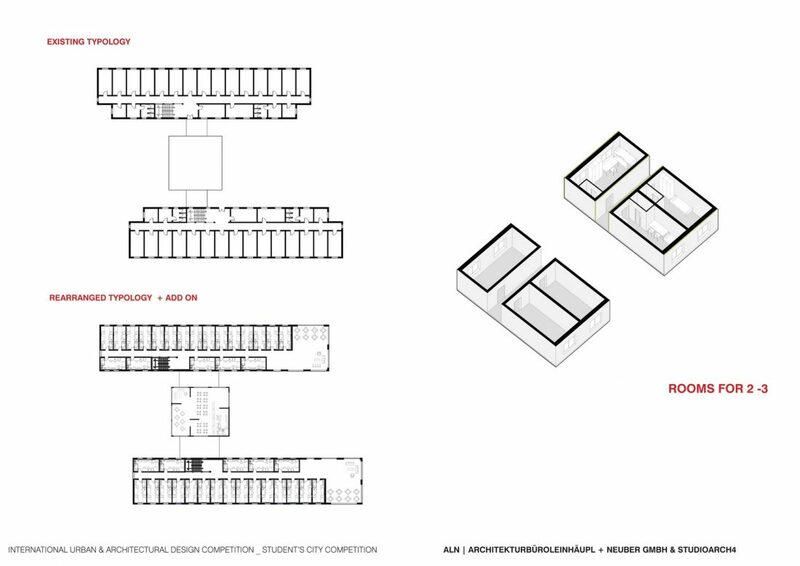 In a more complex and intervened dormitory typology we have the maximum of three access points from which one student can access to the rooms and to the studying and recreation area. 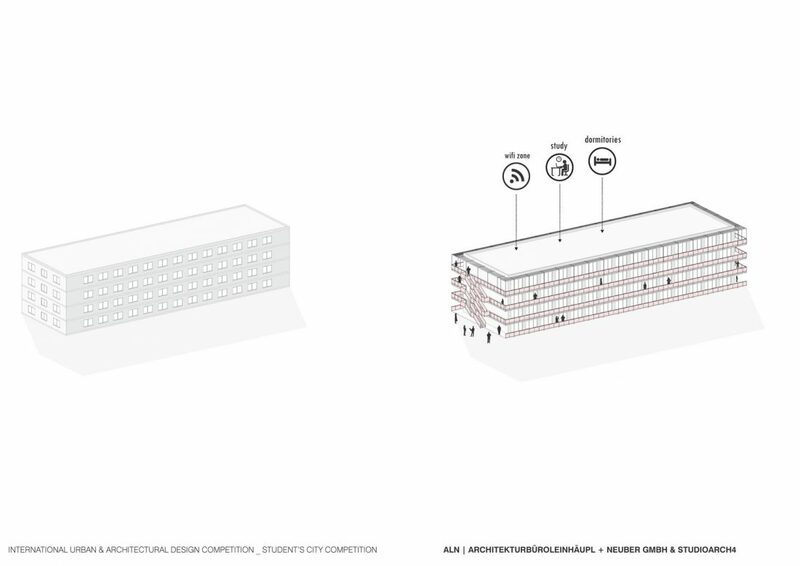 Façade vary from one building to the other, as long as the existing typologies are different. But still besides this variation we aim to generalize the architectural language throughout the approach of a more contemporary minimal approach. We propose as a first step the restoration of the existing facades and the utilization of monochromatic colors from white ones to soft light grays. 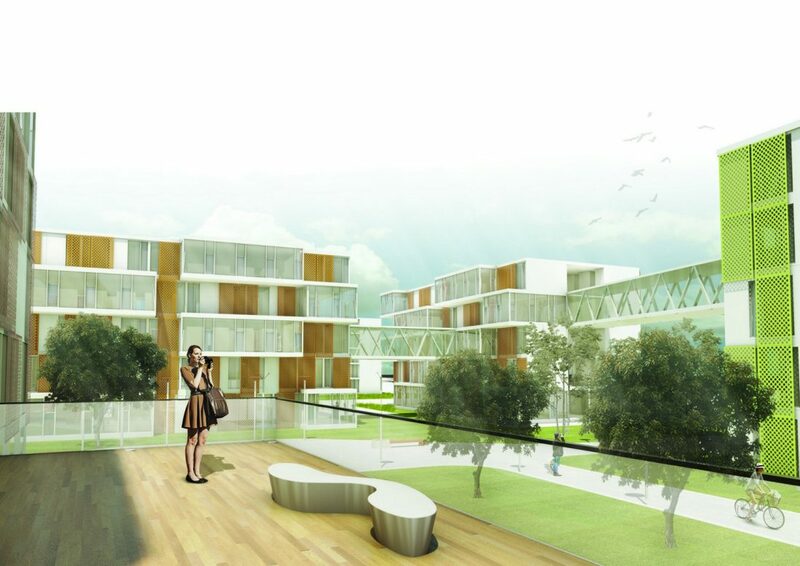 On the other hand for the part where we intervene with the addition of new functions and the construction of a whole new structure, we develop the logic of having a lot of glass modules, and movable brie-solei that make the façade changeable and transparent. The variation of these modules and the intelligent utilization of this strategy will give a new identity to the whole site. 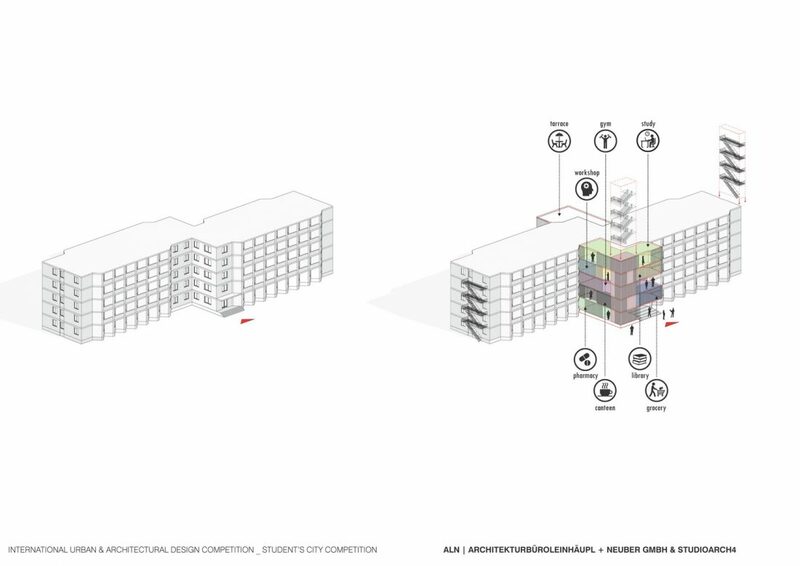 For our proposal of new development, having a building that works as a mini-city, the best choice was to use different patterns for the facades, in order to differentiate the complex parts of the building. This way, orientation throughout the building is made a lot easier. In the inner parts of the courtyards, colors are used to create different identities of the mini blocks, just how neighborhoods work in real scale cities. Transparency is used as a tool to create different configurations of the façade: somewhere we can find totally transparent openings, in other parts this openings become more opaque. The presence of the net (perforated material) can be found again in the new typology. The net has both functions as brie-solei in some parts, but it is also used to create a gradient of intimacy in the relation indoor-outdoor. How to increase the quality of life for the students? How to increase the capacity for accommodation? How to define a strategy for efficiency in communication, comfort and usability? 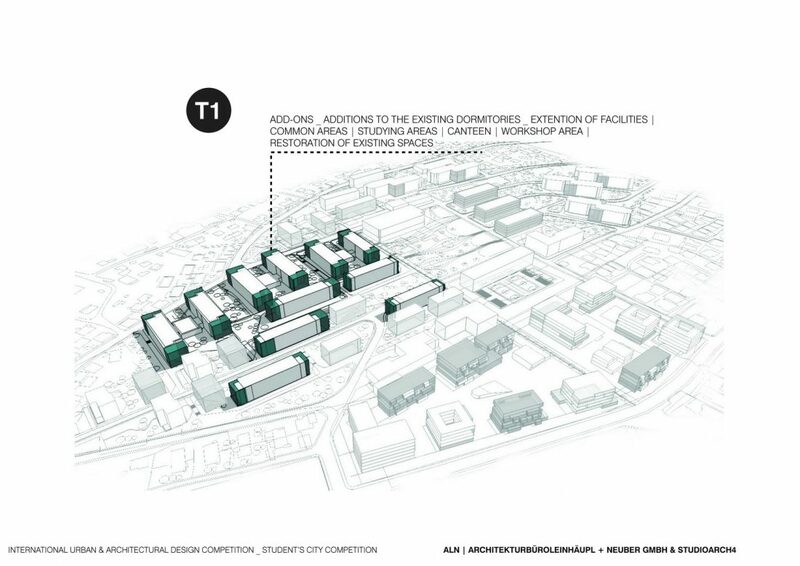 How to redevelop the existing dormitories? How to create a city within a city? 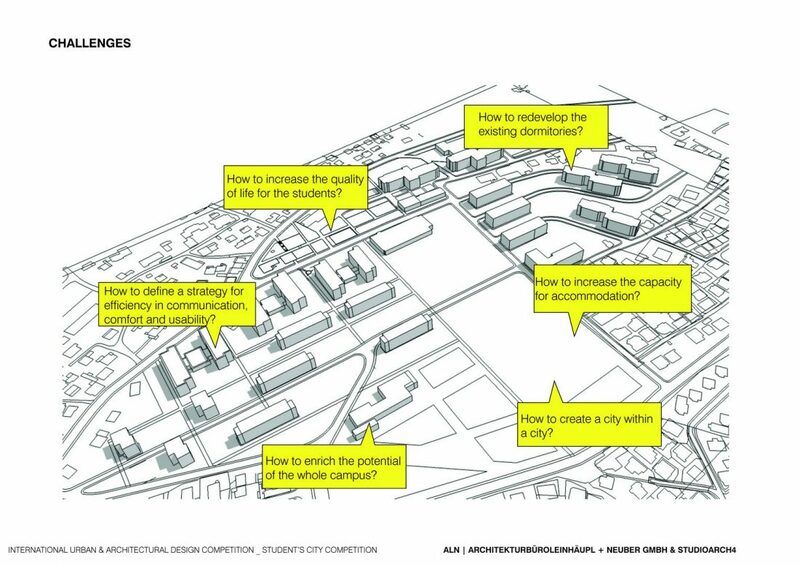 How to enrich the potential of the whole campus? 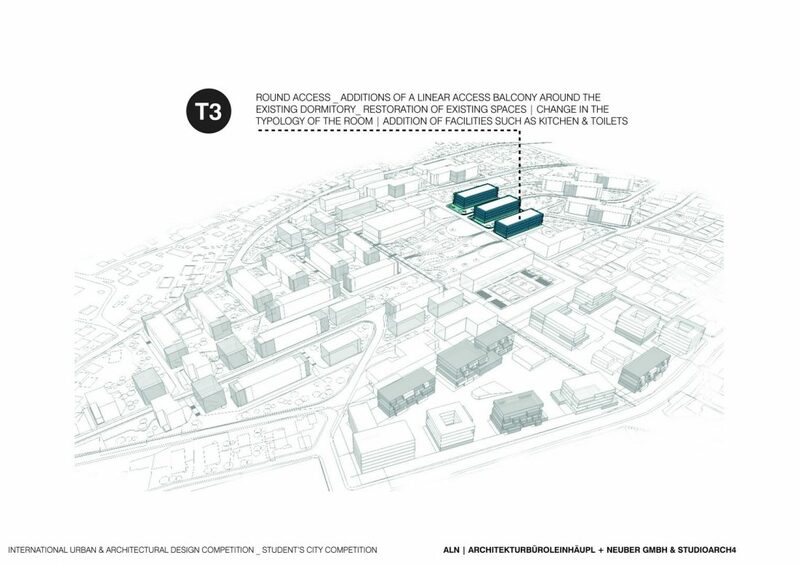 On achieving all the necessary requirements to reach our aim on realizing a hybridization of the Student’s City, we applied an acupunctural intervention. We collected all the necessary functions and programs that were missing inside the city and in the surroundings, and spread them as small interventions in the existing buildings. 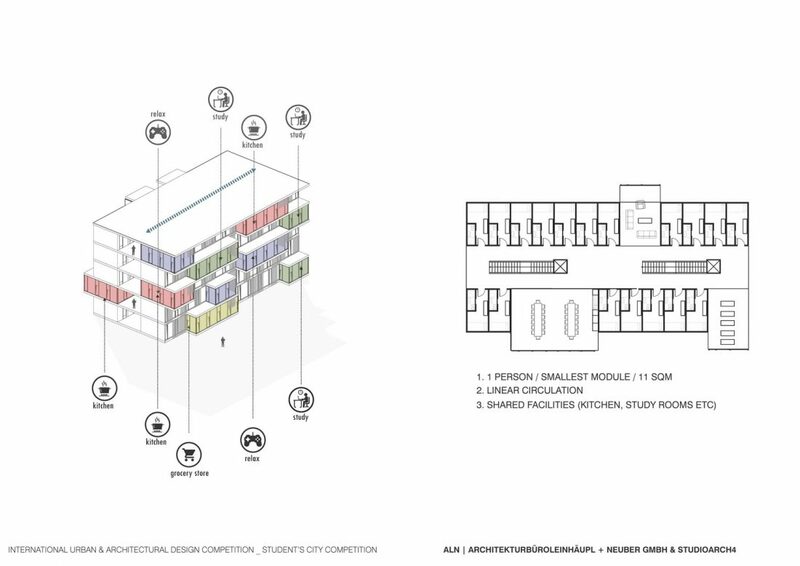 The strategy of having a city for the students, but not only, was a dare idea to introduce a new type of dormitory, where flexibility is the key concept. We implement various possibilities in terms of spatial utilization of the space and maximum usability. We experiment by creating a new hybrid neighborhood, where portions of the buildings create a whole, complement one another and function together. The inclusion of the outdoor in the indoor is as well an important element, from which we get more relaxing and recreating spaces. The first phase is the most urgent one, the reconstruction of the existing buildings. The reconstruction will include the addition of the Add-ons and the restoration of the existing dormitories. Even this phase in itself can be divided in sub-steps, which may include the intervention into different blocks of dormitories in different periods of time. 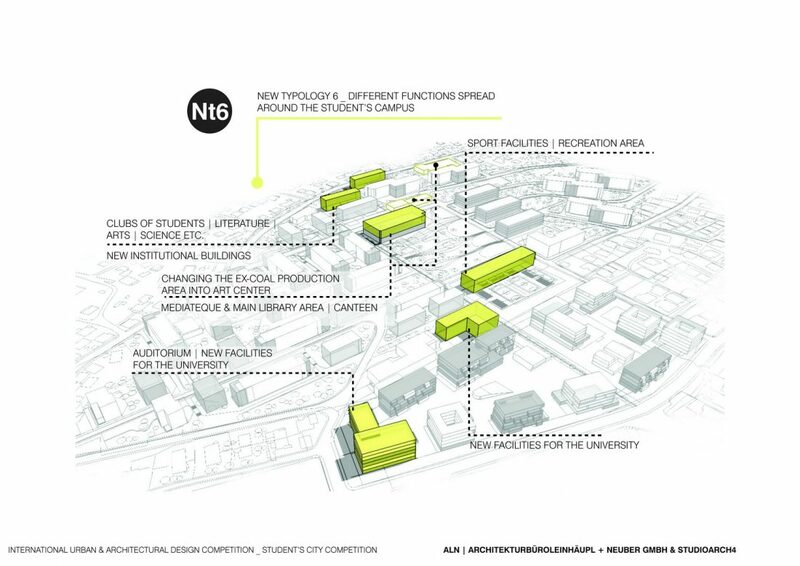 The second phase would be the intervention into the infrastructure of the Student’s City. The construction of the new plaza and the addition of the new artistic center and sport area would be the main elements of the phase. 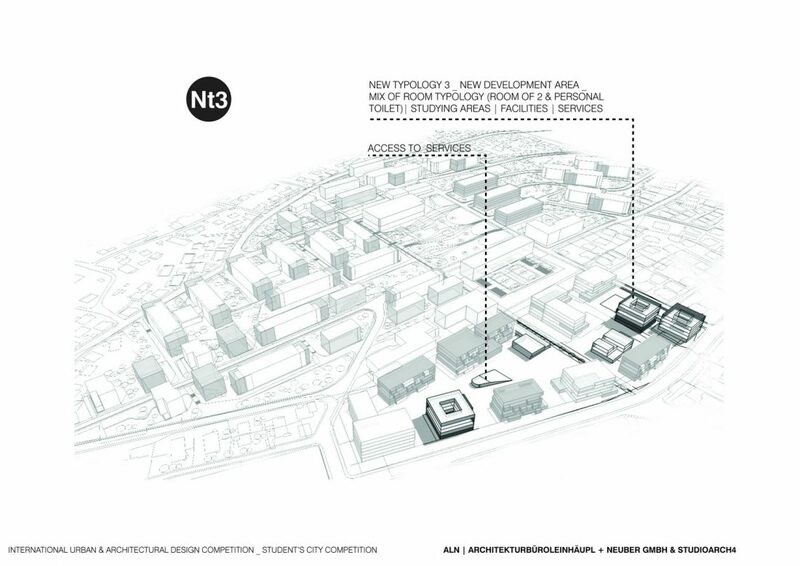 The third phase would be the construction of the new development area. The whole block may be developed in the same time together, as long as the site location it is actually not used. 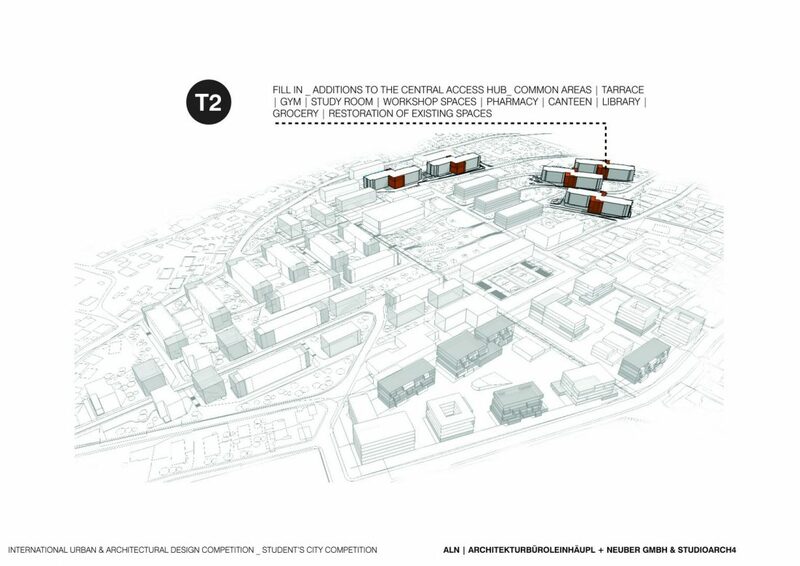 The forth phase would be the addition of the new dormitories in the areas in-between the old dormitories. This phase will include as well the urban definition of the surroundings. 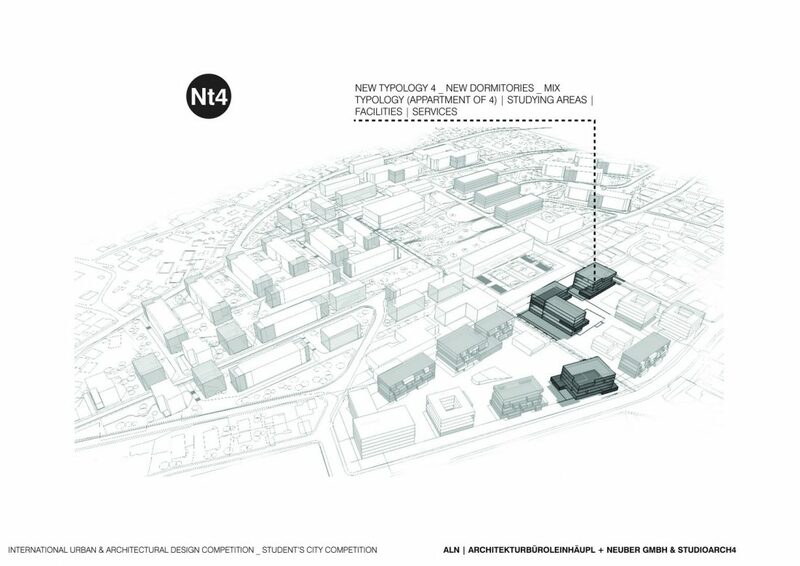 This fifth phase will include the new development of the northern part of Student’s City. 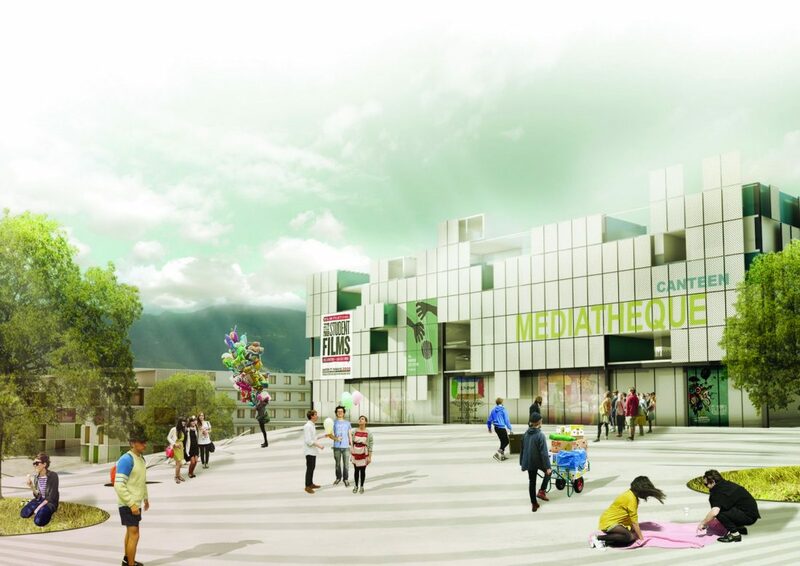 It will be dedicated to the construction of three new other hybrid dormitories and the development of a new artistic area, mediatheque, recreation centers, expo center that will elaborate in relation to the central library and art center.